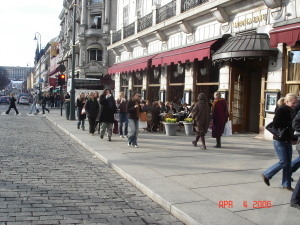 From the corner window of the Grand Café, in the Grand Hotel, where one hundred and one years ago, Ibsen held after-theatre soirees, I watch apple-cheeked children pass on their way to school, their breath blowing before them in wisps of white. Over the road, are the frozen ponds, piled snow and closed-up kiosks of the garden that runs up the centre of Karl Johan, Oslo’s main, and most picturesque, street. Beyond it, buses trams and rattle to and fro. The perfect sky, the sunshine, the bracing air and the snow like softening ice-cream are compelling. I have to get out and explore. 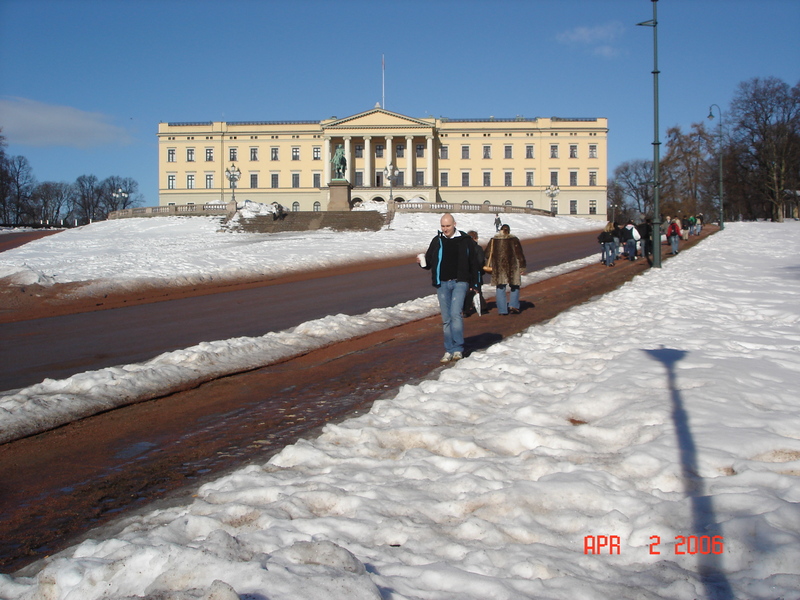 Oslo is a very walkable city, compact, small with gentle hills and not too much traffic. So, armed with the official Oslo City Map, I contemplate my direction – left to the House of Parliament at the town end of Karl Johan, over the road towards the tall masts on steel grey water that I can see between the buildings straight ahead, or right to the Palace? I set off to the right, pausing to check out Paleet shopping centre’s galleries of chic shops. Back on the pavement, mentally noting enticing little side-streets for later on, I cross the road for a turn around the imposing, ornate, dripping-with-stories-and-history National Theatre, then follow the slope of the street between banks of snow and an avenue of skeletal trees. Ahead, a woman shouts and waves me over. I approach with caution – friend or foe? – these are edgy times. She urges me closer, I fearfully follow her pointing finger – bomb or body? But there in the fresh, black soil, where the snow has shrunken away at the pavement’s edge, is a cluster of shiny green shoots – spring bulbs. The woman peers into my face, “Ja?” she laughs and nods “Ja?” “Ja!” I nod and laugh back. Up there on the hill, set in its snowy acres, is the solid, square stone palace, home of the current King, Haakon the third. It looks exposed and vulnerable. A solitary guard stands at the main door, another marches to and fro in front of the guard house. Passers-by criss-cross the surrounding park. I follow a path round the Palace, under the ground floor windows, hoping for a glimpse of the King or Queen. Inside there’s the glow of light on warm wood, the sparkle of a chandelier but no sign of life. I head down the hillside, through the Vika shopping area, where smokers sit, wrapped in blankets, outside cafes. Down at the sea’s edge is Aker Brygge, a former shipyard, now an up-market shopping centre, with a row of smart restaurants overlooking the marina where hardy yacht-dwellers go about their daily business under the gaze of curious tourists. 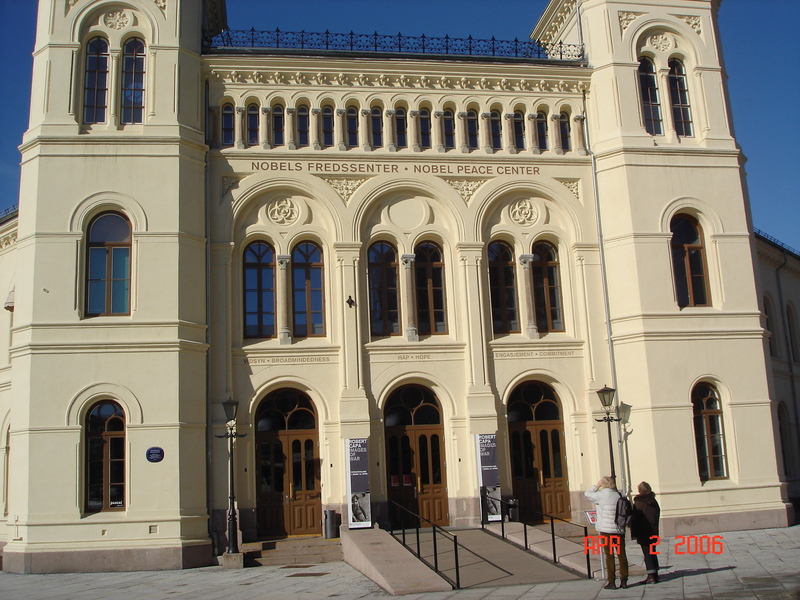 Just round the corner from Aker Brygge a modest, unremarkable building houses the most famous of Oslo’s institutions, the Nobel Center, birthplace of the great Nobel prize for contributions to mankind, known throughout the world as an icon of peace. Ironically, on the opposite side of the bay, stands Akershus fortress, a grim Mediaeval edifice, dark against the snow. During the Second World War it held prisoners of the occupying Nazis. 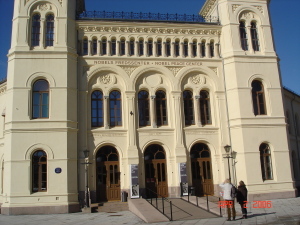 Now, home to the Norwegian Resistance Museum, it tells the terrible story of that wartime occupation and Norway’s struggle to survive it. Leaving, Akerhaus, I cut across through the old town, Christiania, built by King Christian IV, with its 17th century wooden framed buildings and old stone monuments, up the hill and I’m back at the far end of Karl Johan. The sky has darkened and the air has thickened with little white, icy flakes; winter’s not quite gone and summer seems just a suggestion, as I hurry past the heavily decorated leadlight windows of the Parliament building and back to the shelter of the Grand Hotel. Tonight, I’ll explore the warmth of one those bars in the side-streets I’ve mentally noted and tomorrow, the outskirts of Oslo.